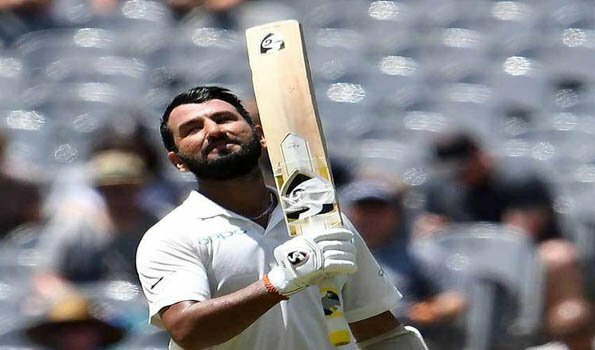 Sydney: Cheteshwar Pujara (130*) and Hanuma Vihari (39*) guide India to 303/4 at stumps on day one of the 4th and the final Test against Australia here on Thursday.The fifth-wicket pair shared an unbeaten 75-run stand between them as India concluded the opening day on top in Sydney. Post tea, Mitchell Starc dismissed Ajinkya Rahane as he bowled a bouncer that took a top-edge off Rahane's bat and wicket-keeper Tim Paine made no mistake. Rahane departs for 18. India were at 228/4 in 70.2 overs. Indian skipper, Virat Kohli also departed for 23 runs, which brought an end to the 54-run partnership. Josh Hazlewood took his second wicket.Earlier in the innings, Agarwal and Pujara continued their second-wicket partnership to 116 runs. The duo put on an attacking show after the break, with their 100-run stand coming off 178 balls. India were 69/1 after 24 overs at Lunch.India won the toss and elected to bat. Opener K L Rahul's poor form continued here too after losing his wicket to Hazlewood in the third ball of the very 2nd over after being caught off at first slip by Marsh.Rahul's 9 came off in 6 balls with 2 fours.After Rahul's departure Mayank Agarwal and Cheteshwar Pujara for the second wicket partnership scored 59 runs.